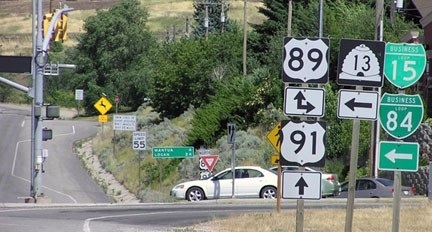 US 91 is tragic figure in the story of US highways. 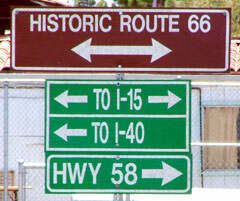 It was an original 1926 route, running for over 1300 miles from US 66 in the Mohave Desert to Great Falls. Later both ends were extended, such that it ran from Long Beach all the way up to the Canada border at Sweetgrass. 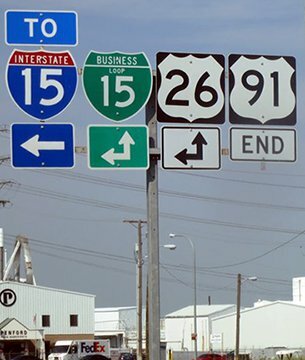 But the advent of the interstate highways pretty much spelled its doom: I-15 completely wiped it out north of Idaho Falls -- and even for its first 100 or so miles south of Idaho Falls, it is a little-used road because it is still in the shadow of I-15. 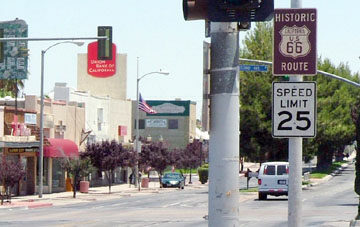 In 1947 the US 91 designation was extended south from Barstow with US 66; see the Long Beach page for details about its endpoint. 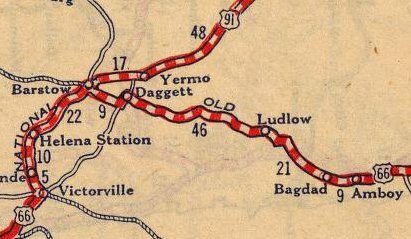 The terminus remained there for nearly 20 years before it was truncated back to Barstow (presumably at the same location shown above). 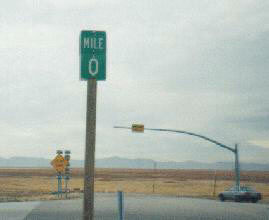 In 1973 California completely decommissioned US 91, so then the south end was briefly on the Nevada line at Primm. But within the next year, both Nevada and Utah decommissioned hundreds of miles of US 91: everywhere it was concurrent with (or had effectively been replaced by) I-15. ...however, that junction was recently converted to a diverging diamond interchange, and the west side of the junction has been opened to development, so it looks quite a bit different today. 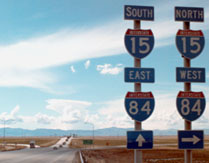 That is the north end of I-15, and also what was once the north end of US 91. 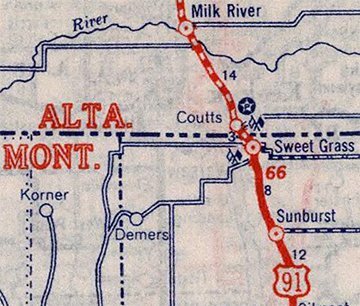 By 1980, I-15 north of Idaho Falls was almost entirely complete through Montana to the Canada line. 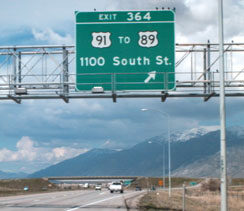 Presumably that is why, rather than co-signing US 91 with I-15, the decision was made to truncate it to its current northern terminus. 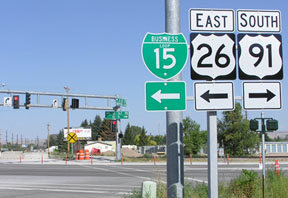 For the next 25 years or so, the designation did not quite make it even to Idaho Falls -- rather, it ended a couple miles south of the city, where it junctioned with 65th Street South (which was the original routing of US 26 and Business Loop I-15... more info on the Idaho Falls page). 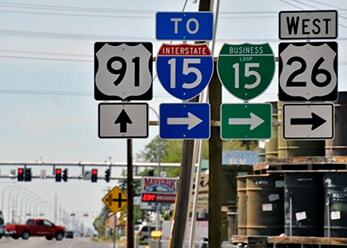 Those routes turn to the west on Sunnyside, while straight ahead is the beginning of US 91. 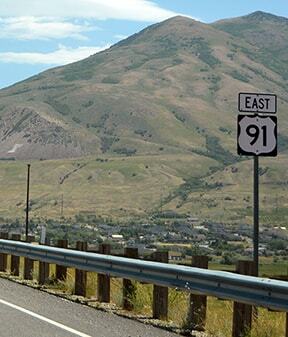 In its heyday before I-15, US 91 continued south from Brigham, together with US 89 along the Wasatch Front: through Ogden and Salt Lake, to the Provo area. There the two routes split to serve opposite sides of Utah's San Pitch, Pavant, and Tushar mountain ranges. 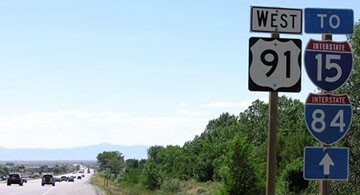 US 91 went through Nephi, Fillmore, Beaver, Cedar City, and St. George: all on today's I-15. A relatively significant segment of old 91 (still drivable) used a different route than modern I-15 between St. George and Littlefield AZ. Then on to Las Vegas NV, and into California: Barstow, San Bernardino, Riverside, and Long Beach. 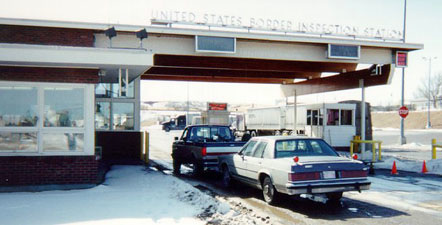 The length of modern US 91 is only about one-tenth of its historic extent. And its branch highway, US 191, is now over ten times longer than US 91. If one were to try and drive historic US 91 from end to end, they would be hounded by I-15 for nearly the entire journey. Like several of the other truly great routes, US 91 has been dubiously "honored" with obsolescence due to the construction of parallel interstate highways. Research and/or photo credits: Joseph Barnes; Chris Elbert; Bruce Kasprzyk; Joe Maloney; Alex Nitzman; Dale Sanderson; Dan Stober; "wbaron"
last updated June 21, 2017.